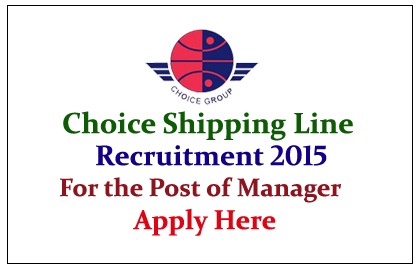 Choice Shipping Line is recruiting for the post of Sales Manager, Documentation Executives, Accountant, and senior Manager 2015. Interested and Eligible candidate can apply here. Candidate should be a Business Management Graduate with minimum 5 to 6 years experience in Logistics industry with good exposure to Tamil Nadu / Chennai markets. He should be responsible for developing business and achieving targets. Candidates should have experience in Logistics related Documentation and Back Office documentation with minimum 2-3 years of experience. Candidate should be well versed with various accounting systems and good communication skills as he/she has to communicate with branches across India. Candidate should be a Business Management Graduate with minimum 5 to 6 years experience in Logistics industry with good exposure to Bengaluru / Karnataka markets. He should be responsible for developing business and achieving targets.